NOW: Jean Sherrard moved in a few feet closer to the northeast corner of Main and Occidental to better show the cars parked where once the landmark hotel sat and also the stylish posts that have closed Occidental between Main and Washington since neighborhood architects Jones and Jones developed Occidental Park for the city in the early 1970s. 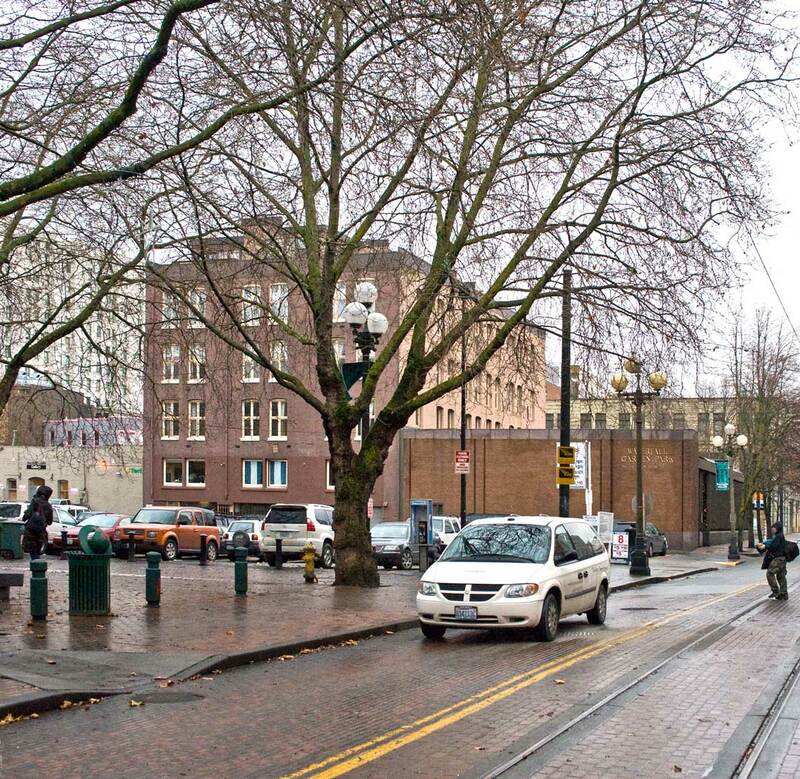 Now I ask readers to think or look back to last week’s presentation of one of the best examples of the old pre-fire Seattle: the Pacific Block ca. 1886. It was kitty-corner to this Occidental Hotel – at the southwest corner here at Main and Occidental. A likely date for this Frank LaRoche study of the Occidental Hotel, AKA Lebanon Building, is only five years later. 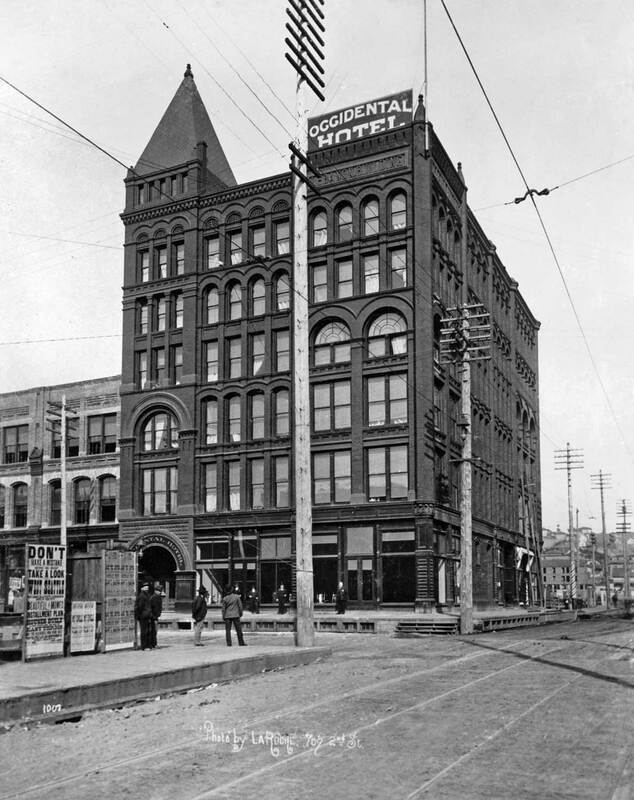 The hotel was built on the fire’s ashes and completed in 1891. Here its namesake bar at the corner is as not yet marked with its own sign. It also seems that windows are still being installed on the Main Street façade, far right. When new, the Lebanon Building was also named for Jesse George, a German-American investment banker who was one of its owners. Much earlier Jesse met his wife Cassandra at Santiam Academy in Lebanon, Oregon, and hence the name. The couple had five children and a home at 4th and Cherry on a lot that is now part of city hall. With Jesse’s death in 1895, Cassandra moved temporarily back to Oregon where she became superintendent of the Portland Women’s Union. Then in 1902 she returned to Seattle and opened a rooming house for working girls in her old home at 411 Cherry. The 13-year-old Cassandra came west on the Oregon Trail in 1853 and arrived in the Willamette Valley with one sister, one horse, one cow and two teenage boys. The sisters’ mother died before they left and their father along the way.